Observation - Large red flying insect - UK and Ireland. Description: Bright red flying insect, over 2 long from tips of feelers to tail, distinctive very narrow waist. It came in through open office window after dark, found it and photographed it on the window the following morning (hence poor colour of image). Bright red flying insect, over 2" long from tips of feelers to tail, distinctive very narrow waist. 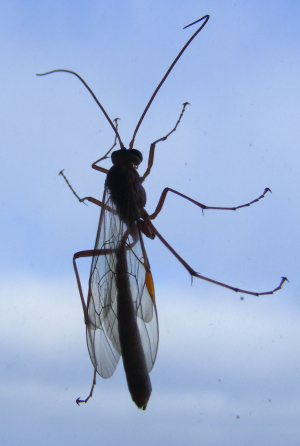 It came in through open office window after dark, found it and photographed it on the window the following morning (hence poor colour of image).